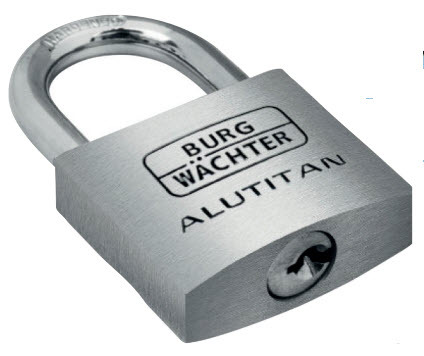 Burg-Wächter is launching the Alutitan 770 range to help retailers capitalise on the growing trend for aluminium padlocks. The new Alutitan 770 exploits the inherent strength and lightness of a special aluminium alloy to deliver a strong padlock that is light on weight yet still delivers good all round performance. The solid aluminium body and rustproof interior offers a superior level of corrosion resistance making it ideal for use both indoors and out. Available in a variety of sizes from 20mm to 60mm, the combination of a hardened shackle and double-locking mechanism (from 30mm upwards) offers a robust security solution for all manner of items from lockers and toolboxes to sheds and garden gates. The Alutitan 770 range is available on an eyecatching display stand, making it an attractive security proposition for retailers and customers alike. Burg-Wächter has been manufacturing padlocks for over 100 years and its name is synonymous with high quality and innovative product development. Following its acquisition of Sterling Locks in 2013, Burg’s extensive selection of security products, including the new Alutitan 770 range, are available to UK retailers from the Sterling Sales Team on t. 0113 391 1293.